Are you looking for ways to make your life a little greener? Then consider recycled Christmas cards this holiday season. Americans send 2.1 billion greeting cards – most made from virgin paper – during the holidays. But by choosing cards made from recycled paper, you’ll be helping to save our trees. 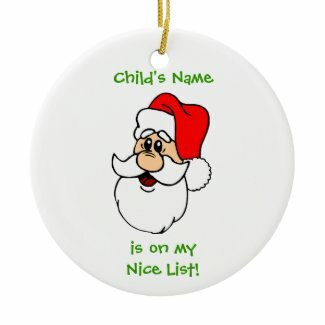 Here’s a list of stores that offer eco-friendly cards for the holidays. PaperCulture sells only 100% post-consumer recycled paper cards and plants one tree in a US national forest for every order received. But they also help reduce the energy required to ship your greeting cards by offering the option to personalize each card individually online and then have them shipped directly to your recipients – no extra shipping to your door! And this service is FREE. All you pay is the cost of postage. Of course, you can also have the cards shipped to you so you can send them out, but you’ll have to pay for shipping. My Good Greetings only sells cards made of 100% recycled Forest Stewardship Council (FSC)-Certified card stock (50% post-consumer waster) and pairs them with 100% recycled envelopes manufactured with 100% post-consumer recovered fiber. And you can also feel good about purchasing your cards online, as they send packages with 100% recycled labels and recycled shipping materials. If that’s not green enough, they offset their carbon footprint through Greenshipper. Minted.com allows customers to choose the type of paper they’d like their cards printed on, including the option of FSC-certified, 100% post-consumer waste paper manufactured with wind-power. They have a nice selection of flat and folded photo holiday cards, and they make it easy to find what you want by allowing you to sort by format, number of photos and other options. You’ll find two types of cards in their Environmentally Friendly Christmas Card category – recycled paper cards and wind power cards. Cards are marked with icons to let you easily see which ones are made at low-impact, emissions-free mills powered by wind-generated, renewable energy, which ones are made from recycled paper, and which ones are made from raw materials that have been certified by the Forest Stewardship Council. In addition to offering a nice selection of regular green Christmas cards with holiday images, Pear Tree also offers recycled photo cards that contain up to 100% post-consumer fibers. Although they don’t have a category specifically for recycled greetings, Fine Stationery has over a dozen designs you’ll find if you search for recycled Christmas cards on their site. Some contain post-consumer fiber. You’ll just need to read the descriptions to discover which recycled cards includes post-consumer waste. Holiday Classics offers a variety of recycled Christmas cards and some of them are also printed with soy ink. Detailed card descriptions help you determine which cards have 100% recycled content, post-consumer content or soy ink printing. 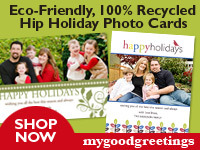 RedStamp.com offers over 30 earth-friendly Christmas cards, and they make it easy to find them with a category devoted to Eco-Friendly products. You can easily tell from the descriptions which cards contain post-consumer recycled paper content, and which are printed with soy inks or created with renewable energy. With this many options, you’re sure to find recycled Christmas cards for every taste and budget. Happy holidays!